Tube complement: 12A8G mixer/oscillator, 12K7G IF, 12Q7G detector, 35L6G audio output, 50Z7G rectifier, Zenith 100-79 ballast. 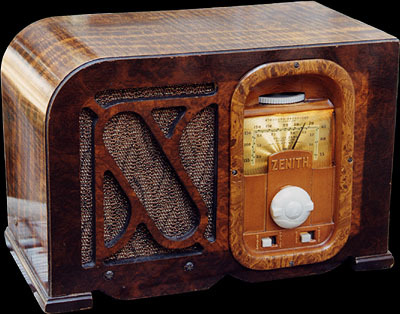 This radio is another of the notorious upside-down Bakelite chassis models. The wood cabinet is finished on all sides, and the chassis slides in from the bottom. This radio also has an unusual circuit design variation—a voltage doubler power supply. 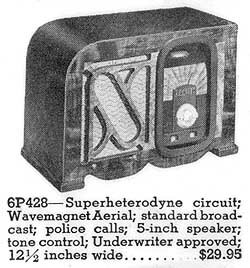 Most radios without a power transformer were AC/DC sets, which, while saving the cost of the expensive transformer, caused the available plate voltage for the circuit to be limited to approximately the value of the line voltage, 115 volts or so. This set uses a voltage-doubler circuit in the power supply, which increases the available plate voltage without requiring a power transformer. Copyright © 1996-2010 John C. Pelham. All rights reserved.